Pharrell recently announced plans to launch a new jeans collection with the denim label G-Star RAW. The collection, called G-Star RAW for the Oceans, will be created using fabric from Bionic Yarn. We’ve been sterilizing and melting down plastic bottles to make synthetic threads for years now but Bionic Yarn’s new thread will apparently originate with plastic waste pulled from the ocean. The details aren’t available yet, though. Hat tip Grist. Culling plastic waste from the ocean won’t be easy. Plastic doesn’t float around in neat islands. It’s more like a disgusting soup. The fuel needed to remove the plastic and clean it could end up being more than the petroleum saved through recycling. Plus, if you ever forget how large the oceans are, think about the drifting cruise liner that’s been eluding discovery for a year. If one person can make these herculean challenges seem doable, it’s probably Pharrell. He’s featured on Daft Punk’s “Get Lucky” — a song that even got a Russian police choir busting moves. There’s his huge meme-worthy hat. And he’s 40 years old but has such smooth skin that he recently had to dispel vampire rumors. 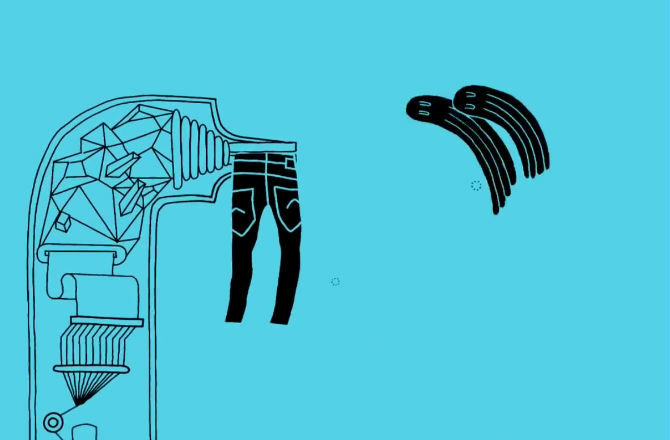 Finally, there’s this upbeat, catchy video about the jeans. We’ll have to wait and see whether the technical aspect works out, but knowing Pharrell’s style, those jeans are going to be tight. Post originally featured on Discovery. A five-year-old boy from California obsessed with garbage trucks got the surprise of a lifetime from the garbage man he religiously greets at his family’s home every Monday. Daniel Mulligan, of Ojai, Calif., became fascinated by garbage trucks as a toddler after his mother, Robin Newberger, showed him YouTube videos of garbage trucks as a way to ease his fear of the trucks’ loud noise. Daniel, who has autism, is drawn to the order and precision that comes with the weekly trash pickup and the organization of the trash cans, his mother says. On Monday, Daniel and his parents – Newberger and dad, David Mulligan – did their usual routine of waiting outside for the recyclables collector, Manuel Sanchez, to arrive, when Sanchez surprised them all. Sanchez, an employee of a private, family-owned trash collection company, got out of his truck and presented Daniel with a toy garbage truck of his own. The family was even more surprised when they realized it was the same toy truck that Daniel received at Christmas but accidentally broke it the same day. Newberger says that Sanchez jokingly asked Daniel, “Do you want this one too?,” pointing to his real garbage truck. “I said, ‘He does want your truck,’” Newberger recalled, adding that Sanchez quickly got back into his truck after the exchange in order to finish his route. Sanchez’s employer, E.J. Harrison and Sons, found out about their employee’s good deed and gifted him with a gift certificate to a local restaurant. The video of Sanchez giving Daniel the truck has gone viral, with more than 60,000 shares and 6,000 likes. The response has been so overwhelming that Newberger created a separate Facebook page, “The Gift,” as a place for parents of children with autism to share uplifting stories. “The response has been so overwhelming,” she said. A commercial cargo ship ended its five-week visit Tuesday morning. 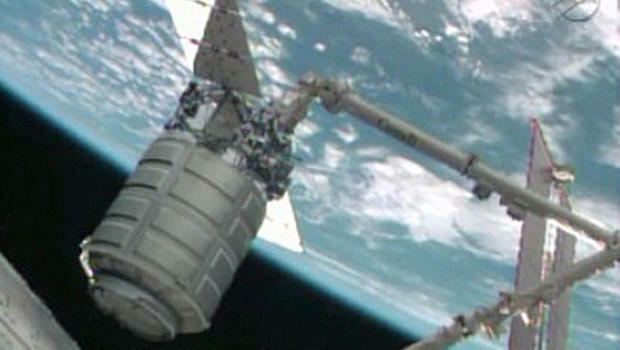 NASA astronaut Michael Hopkins used the space station’s big robot arm to release the capsule, called Cygnus. Cygnus is filled with garbage and will burn up when it plunges through the atmosphere Wednesday. The ants are still aboard the space station. They’ll return to Earth aboard another company’s supply ship, the SpaceX Dragon. NASA is paying Orbital Sciences and SpaceX to keep the space station stocked.